Make Your Home, Camping Or Travel Moments Unforgettable With Your Favorite Drink At Hand! Are you tired of cheaply-made travel tumblers leaving your refreshing water, wine or beer lukewarm? Have you had enough with glasses wine or champagne cups shattered into 100 pieces in the middle of your romantic or family dinner? 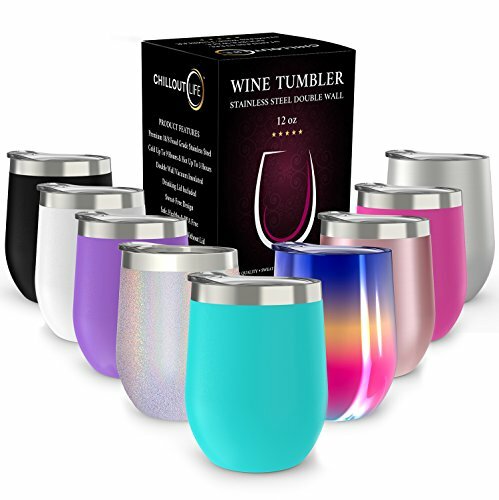 CHILLOUT LIFE colorful 12 oz stainless steel insulated wine tumblers are the answer to durable, sturdy, unbreakable drinkware solution for your home, office, picnic and nature adventures. Get Your Hands On A 12 oz stainless steel wine tumbler with lid That Stands Out! Perfect for coffee, wine, tea, cocktails, smoothies, ice coffee, champagne, beer, ice cream and more, this 12 oz insulated wine tumbler with lid is ready to be offered as a mind-blowing gift! Spoil your beloved friends, family members, nature lover, or a BBQ addict to the best 12 oz stainless wine tumbler gift and make them love you a bit more! Get Yours Today Before We Run Out Of Stock, Try Our 12 oz Stemless Wine Tumbler Risk Free NOW! DOUBLE WALL VACUUM INSULATED PERFECTION in a stemless wine tumbler made from lifelong Stainless Steel! Set off on your refreshing picnic, hiking or camping adventures with your water, wine, or cocktail icy-cold for 9 hours or your coffee and tea scalding-hot for over 3 hours! It is an insulated stainless steel wine glass with a removable BPA-free lid, designed for SWEAT-FREE convenience! Use it as a wine glass tumbler or stick your straw in your refreshing drink through the straw-friendly lid! UNBREAKABLE & MADE FOR LIFELONG USE! Steer clear of disposable plastic cups that harm nature or glass cups that easily break! Make your contribution to reducing pollution with a REUSABLE, ECOFRIENDLY, SHATTERPROOF insulated wine glass. It is made from unbreakable 304 18/8 food grade stainless steel, with DOUBLE-WALL insulation and comes in vibrant colors, a special treatment that minimizes fading and chipping and provides you an ULTRA solid, ANTI-SLIP grip! GET A MODERN, EYE-CATCHING 12 Oz WINE TUMBLER that will add color to your life! Comfortable in the hand, portable and lightweight to take on your outdoor adventures! Worry no more about your little adventurers breaking their smoothie/juice/water or milkshake cups. UNBREAKABLE and SAFE for kids, teenagers and adults, it is a cute, trendy and youthful colored metal wine glass, your #1 choice in home/camping/holiday/sports/ travel stainless wine glass to go! OFFER A GIFT TO REMEMBER! Eye-catching, decorative and perfect for all hot & cold drinks, this 12 oz stainless steel tumbler will thrill the lucky recipient! Offer it to your little angel who just likes a tumbler cup "like mom's or dad's" or to nature lover and enjoy their ear-to-ear smile! It makes a Birthday, Christmas, Valentine's, Mother's or Father's Day gift that will show off your excellent taste! Spoil your loved ones with an irresistible 12 oz stainless steel tumbler with lid! YOUR 100% SATISFACTION IS OUR TOP NOTCH! At CHILLOUT LIFE, we walk the extra mile to ensure our customers' complete satisfaction. This is why we back our 12 oz. stainless steel wine tumbler glass with 100% Money Back Guarantee and prompt, friendly Customer Service, to help you buy with confidence. If you are not positively thrilled with our 12 oz. insulated wine tumbler with lid, just let us know and we will issue a prompt replacement or full refund- HASSLE FREE! If you have any questions about this product by CHILLOUT LIFE, contact us by completing and submitting the form below. If you are looking for a specif part number, please include it with your message.